How much do you love coffee? A lot right? How much do you love saving on coffee making products? Probably as much as you adore the drink itself so we know the importance of saving cash while indulging in something you love. That’s why we compiled a list of the best espresso machines at really low costs. Coffee is the cornerstone of any hot morning beverage, and when you’re about to start the day, the last thing you need is a badly made cup-o-joe. So, if you’re a coffee-head like we are, then continue reading because it’s about to get really tasty. How Many Types of Coffees Can You Make? What Does the Semi-Automatic Look Like? What Does the Drip Brewer Look Like? We know you work extremely hard to earn your salary, and we know you can’t just make money rain down to buy expensive machinery. You would like to buy the top of the range espresso machine but your budget simply doesn’t allow it. What if we told you you could purchase an espresso machine that’s good quality and it won’t break the bank? You’ll still have a little extra money left over to buy the coffee beans you love. Before we get started on these amazing products, let’s give you some aspects of an espresso machine you should look for before buying one. Not all espresso machines produce the same type of coffee, so it all depends on your preference. Some machines only produce espressos but if you like milky based coffees like lattes, you will need a machine with a steam pipe attached or a milk frothing accessory. Capsule machines: These machines use capsule coffee cups that you place in the machine and at a click of a button it will produce an espresso in just a few seconds. These are small in size and extremely easy to use. Bean machines: Bean machines have their own internal mechanisms that allow you to throw in fresh beans to be ground down to make a freshly brewed cup of coffee. You can also use store bought ground coffee. Traditional machines: These machines allow you to use coffee pods or ground coffee. The coffee goes into a basket called a portafilter which is placed into a mechanism that’s fitted back into the machine. Hot water runs through this filter and into your cup. An espresso machine can be fully automated which means that depending on the ratios and temperature it can save the information of the last cup of coffee you made. This allows you to continue making your favorite cups of coffee continuously with just a click of a button. Some machines have plates on the top that you can place your cups on for storage purposes. Depending on the machine, the plate can also be heated. This allows you to warm up your cups before and after producing coffee to keep the beverage hot. If you don’t want to fill the machine up every time you want to use it, it’s worth looking for a machine that has a large water jug attachment. When you’re out looking for the perfect machine, these important features will help you identify the winner. You want a machine that has a large drip tray. Make sure the tray is easy to remove as you will need to clean this tray on a regular basis. If you want to make large quantities of coffee at a time, you will need a machine with a large water tank capacity. The tank must also be easy to remove and put back into place. Why we like it: The DeLonghi EC702 is an incredibly dynamic machine, capable of doing much more than simply giving you an amazing cup of coffee. 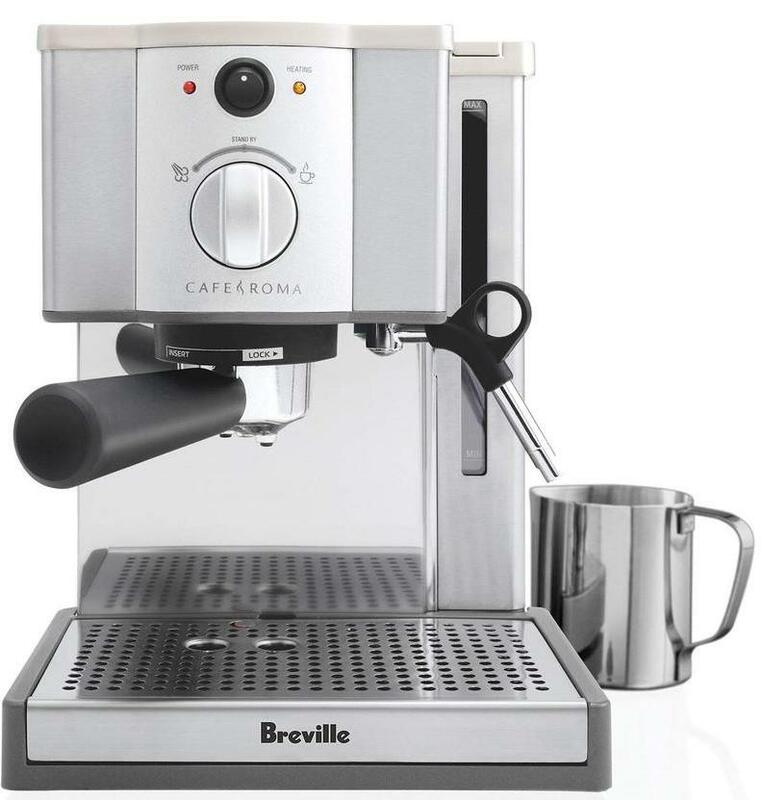 This machine is on our top list of inexpensive espresso machines because of its versatility. Select between the types of coffee you prefer without changing too many mechanisms. With its easy to use milk frother, you will be able to make the perfect cup of cappuccinos as it mixes the perfect amount of steam and milk to give you a rich and creamy cappuccino topping. 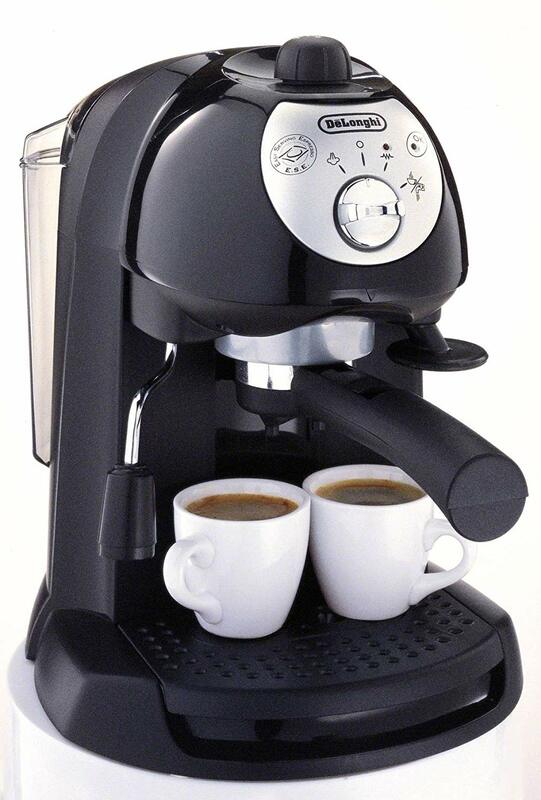 The DeLonghi EC702 has a unique no drip design, making clean up time painless and simple. The machine has an amazing user friendly start up design and includes a durable stainless steel boiler so you can enjoy years of perfectly made cups of espresso. The EC702 comes with all the components suitable for a semi-automatic espresso machine. Its steel drip tray is easy to remove for better cleaning maintenance. This machine has a twin brewing cycle so you can make two cups of espresso instead of one. You can warm up your cups before making your espresso by placing them on the heating tray on top of the machine. This machine also has a compartment to place all of your accessories. The DeLonghi has a metal exterior that’s silver in color for that added dash of style in your kitchen décor. 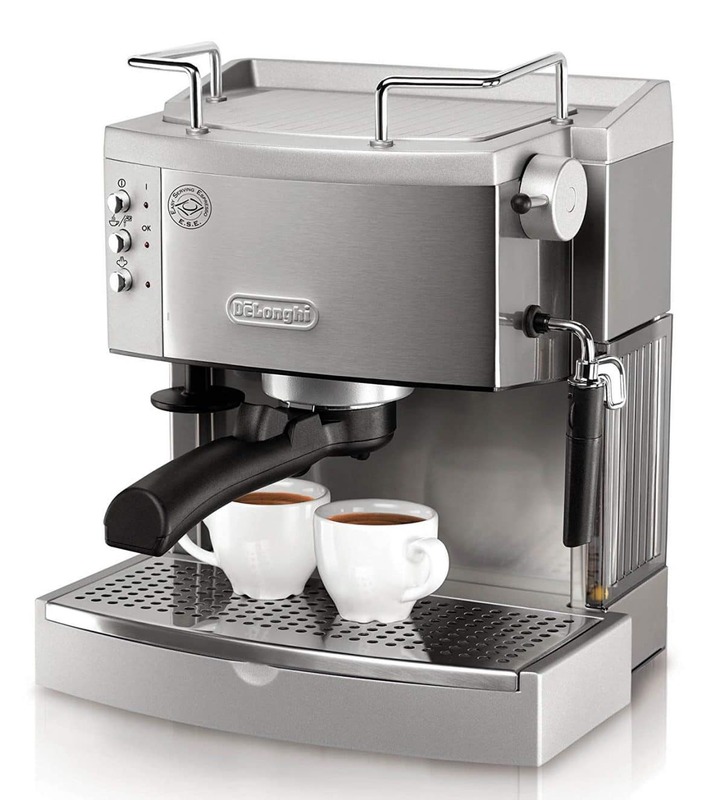 The DeLonghi EC702 espresso machine has a 15 bar pressure suitable for making rich crema for your espressos. It comes with a 1.3-liter removable water tank and an integrated coffee grinder so you can grind your own coffee beans to the coarseness you prefer. Why we like it: Rushing to make your shot of espresso in the mornings is the thing of the past with the Hamilton Beach Espresso Machine. Quick and easy to use this machine can give you rich espressos within seconds, making your morning routine a breeze. Fill your home with delectable aromas of café quality espressos. It will feel like you’re traveling to another country the way it produces such decadent tasting brews. The amazing part is you can make cappuccinos too. How about a café latte, or a good cup of mocha? There’s no limit to what this little machine can do. 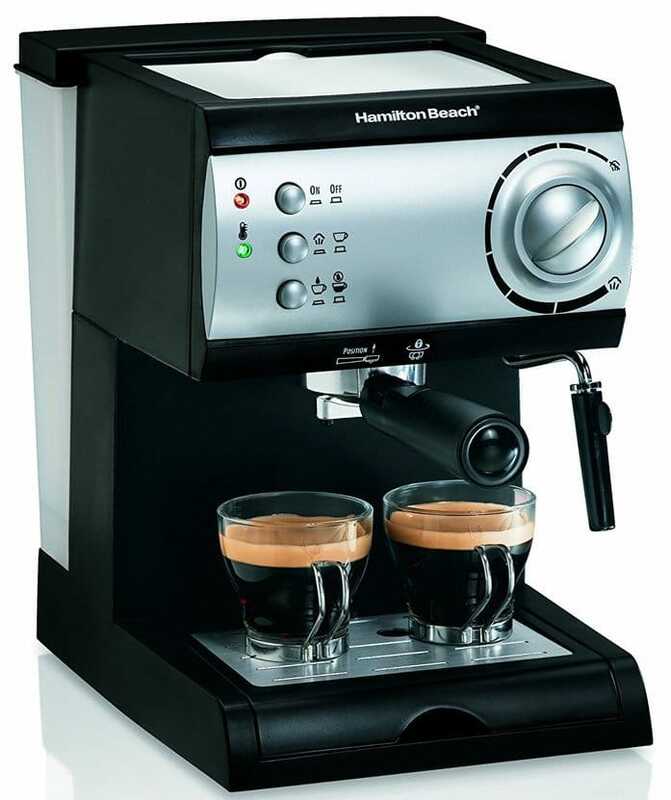 The Hamilton is a light weight durable espresso machine that includes selector dials for espresso and steam functions. Its swiveling milk frother makes it simple for you to create the best creamy lattes and foamy cappuccinos. The Hamilton espresso machine comes with a removable drip tray to prevent spilled coffee from getting all over your counters. It’s easy to clean and to put back together again. This machine has a dual portafilter so you can make double the amount of espressos. This machine has a sleek design that’s black and silver in color. It has indicator lights for added simplicity and it comes with a slide & lock filter so you don’t have to worry about it falling out while making your espresso. The Hamilton has a 15 bar pressure pump making your espressos rich and decadent. It has a 1.5 litre water tank which is perfect for making multiple cups of coffee without it running out. It has a durable pannarello steam wand and a dual portafilter so you know you’re buying quality. What makes this a dynamic machine is you can use it for ground coffee as well as E.S.E (easy serving espresso) pods. With the aluminum boiler, you can be sure to have the best tasting coffee every time. Why we like it: Have you ever heard of a nonelectric portable espresso maker? Well, now you have. What makes the ROK EspressoGC so amazing is that no matter where you go, you can now have coffee on the go. It requires no electricity and it’s completely safe to use. The ROK Espresso is completely manual allowing you to make the perfect strength brew to suit your preference; Brilliant for those old school baristas or some older generation members who may not be tech-savvy. With an integrated glass composite and a better-insulated piston, it produces more pressure resulting in hotter beverages with a rich decadent crema. It’s slip resistant which makes it ergonomical and it has a stainless steel finish so you don’t have to worry about your ROK EspressoGC getting any rust damage. 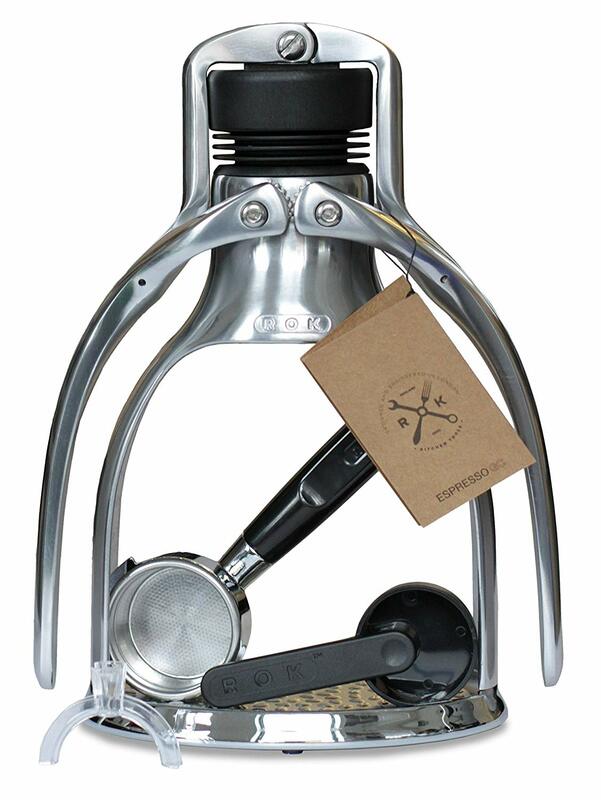 The ROK EspressoGC has everything you need to make the perfect cup of coffee anywhere in the world. This is a completely portable device that uses no electricity. It has pressure arms that you push down manually to create your own pressure. This product comes with a measuring spoon and a measuring cup & a stainless steel portafilter. It’s silver in color and the parts are all stainless steel with sturdy metal finish. The nonslip grip ensures safety. This nifty manual portable device has an 8-10 bar pressure pump by using the arms of the device to press down to create the pressure yourself. It also comes with a detachable spout. Why we like it: Any coffee machine that has a dual function for a different coffee taste is something we would definitely put on our list of best buys. The convenient pod filter assists you with rapidly making cups of coffee for busy days, while the ground coffee filter gives you that traditional flavor of a slower brew. Of course for the more milk and cream based coffee lovers out there, you can enjoy the taste of brilliant café grade lattes and cappuccinos. That’s because this tiny versatile machine comes with a swivel milk frother giving you that lovely creamy topping everyone loves. You can produce traditional Italian espressos in the comfort of your own home, and with its quality and rich coffee production, it’s guaranteed to make your kitchen feel like a European coffee shop. This espresso machine has a swivel jet frother making it hassle-free to make creamy foam for the top of your lattes. It has a dual brewing cycle which makes different flavors of coffee. The BAR32 Retro comes with all the added components you need to make great cups of espresso such as a removable drip tray and a removable water tank. 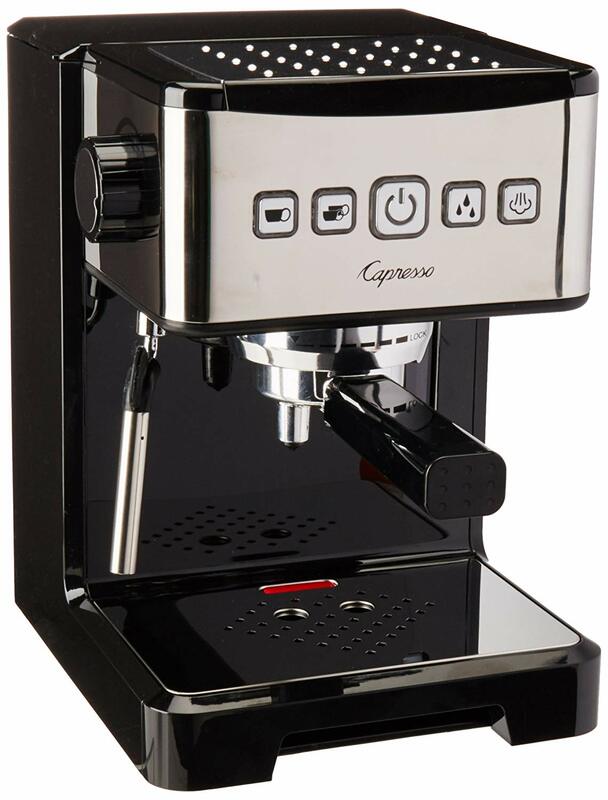 This compact espresso machine comes in a black and silver color and has a plastic & stainless steel exterior. That works for offices and homes alike. There’s a 50 mm tamper and a dual cup portafilter so you can serve your guests faster. You can use ground coffee or coffee pods. For added flavor, it has a stainless steel boiler and a 15 bar pressure pump. With its dual thermostat control, you can make different types of coffee with a touch of a button. Why we like it: The Nespresso Inissia has an elegantly compact design capable of producing A-grade espressos in a fraction of the time others do. The machine comes in a wide range of beautiful colors to match any kitchen décor. With its easy to use one-touch option, this tiny but powerful machine will make you feel like a professional barista without all the fuss of dealing with portafilters. There will be no more grinding of coffee beans, tamping or dosing when you own this. All you have to do is pop in a Nespresso coffee capsule and you will have an excellent brewed cup of coffee to help you get that extra kick for the day. It’s as easy as simply filling up the water tank, placing the capsule in and pressing the button to get your brew started, filling up your home with the wonderful aroma of espresso coffee. The Nespresso Inissia is so user-friendly anyone in the family can use it as the cleanup method is simple and fast. The machine ejects the used capsule after brewing making it much more fun brewing espressos. No one wants to endure hours of clean up time. The one-touch dial mechanism makes this a user-friendly espresso machine. It’s light in weight and comes with a foldable drip tray for simple maintenance. There is a capsule slot where you place your espresso capsules and a dispenser for when the capsule has been used. This amazing machine comes with 16 Nespresso capsules and a manual explaining the different flavors of the capsules. The Nespresso Inissia comes in multiple different colors so you can pick one to suit your kitchen décor. It has a nonslip grip handle making it easy and safe for you to move around. The machine is light in weight so it won’t strain your wrists or arms when you pick it up. The indicator lights tell you when the water tank is running low so you can fill it up again. This is an automatic drip brewer with a nine minute automatic shut off time for added safety measures. This machine gives you a two cup size brewing option and has a 19 bar pressure for that added crema. Why we like it: Everyone loves added accessories when they purchase something new. With the Breville ESP8XL, you will not only get an amazing machine but you will receive an added stainless steel frothing pitcher, a tamping tool, a measuring spoon, and a cleaning tool. The Breville ESP8XL has user friendly features making it suitable for any aspiring novice barista to use. It’s definitely not too complicated to get a hang of once you start using the machine as it has everything you need integrated into the design. The Breville ESP8XL has a beautiful stainless steel finish making it a wonderfully elegant kitchen appliance to have on your counter-top. The Breville ESP8XL has components that any coffee connoisseur will love including a traditional style steamer that you don’t usually find on a budget machine. It also has a removable water tank to make filling up with water easy and hassle-free. This espresso machine comes with added accessories to make it simple to use. It has a cup warming tray and a removable grid as well as a removable drip tray that make for easy cleaning. The machine has an overall stainless steel exterior with traditional design fixtures. The single cup fitting is suitable for single people who love coffee. Its silver outer layer is suitable as more formal décor so you can use this at the office and make a good impression on guests. This machine comes with a number of added accessories such as a stainless steel pitcher and multiply sized portafilters. The integrated dual-wall crema technology and coffee grinder make it easy to create high quality coffee. For health benefits and for the best tasting coffee the water tank comes with a charcoal water filter. For added flavor, there’s a stainless steel boiler and a 15 bar thermoblock pump. Why we like it: The Capresso 124.01 Ultima Pro machine has everything you need to impress your guests when it comes to making the perfect cup of coffee. Its heavy duty exterior is designed for the harshest of kitchen environments so you don’t have to panic about your new gadget being damaged. Not only does this machine make the best silky textured coffees, but its smooth and sleek design is also suitable for any sophisticated kitchen décor, making it the ultimate centerpiece. You’ll be the envy of all your coffee connoisseur friends without straying from your budget. This espresso machine has a powerful milk frothing wand to make delicious café lattes and cappuccinos. It has illuminated operating buttons for simplicity and style. The Capresso comes with an added measuring coffee scoop to assist you in taking the perfect amount of coffee every time. It also comes with storage space for accessories and it has an integrated cup warmer. It includes a durable self-tamping portafilter which will help optimize your cups’ flavor. 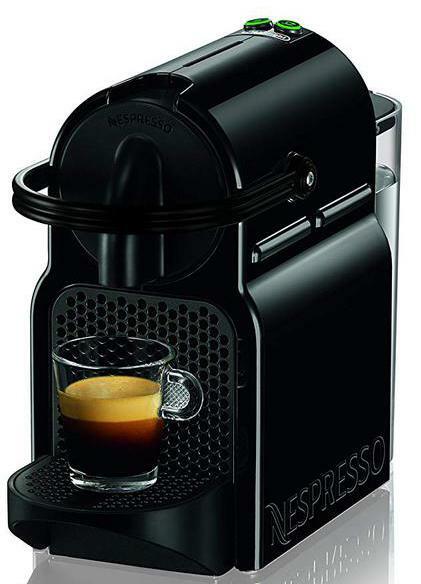 The Capresso comes in a black overall durable design and is more compact than most espresso machines. It has some stainless steel components with a dual portafilter and user friendly dials on the front face that look quite impressive. The Capresso comes with a removable 34 oz water tank and a 58mm sieve. It has a programmable cup volume allowing you to make the amount of coffee you prefer. Thanks to an adjustable water temperature function you can make the type of coffee you want. You can use this machine for ground coffee as well as coffee capsules so it’s ideal for families where each individual has different preferences. Why we like it: No one likes clutter, especially in the kitchen. When you buy appliances you opt for something that takes up minimal counter space while still serving its purpose. The Mr. Coffee Café Barista is the espresso machine that achieves just that. With its small stature, it doesn’t take up a lot of counter space but it still provides you with great tasting espressos and cappuccinos. Unlike most espresso and cappuccino machines, this one is a little bit different in terms of design. The machine is a semi-automatic allowing you to multitask while making your favorite cup-o-joe. You would think that this feature ups the price but it’s still affordable. With its integrated automatic milk frother, it takes out all the added guesswork making it easier for you to complete other parts of the coffee making process. If you have no idea how to make coffee with an espresso machine, this would be the perfect appliance to get you started. This machine comes with a dual filter and a frothing tube lever assisting you with your latte making skills. With its portafilter retention clip, you won’t have to worry about it falling as it will be securely locked into place. 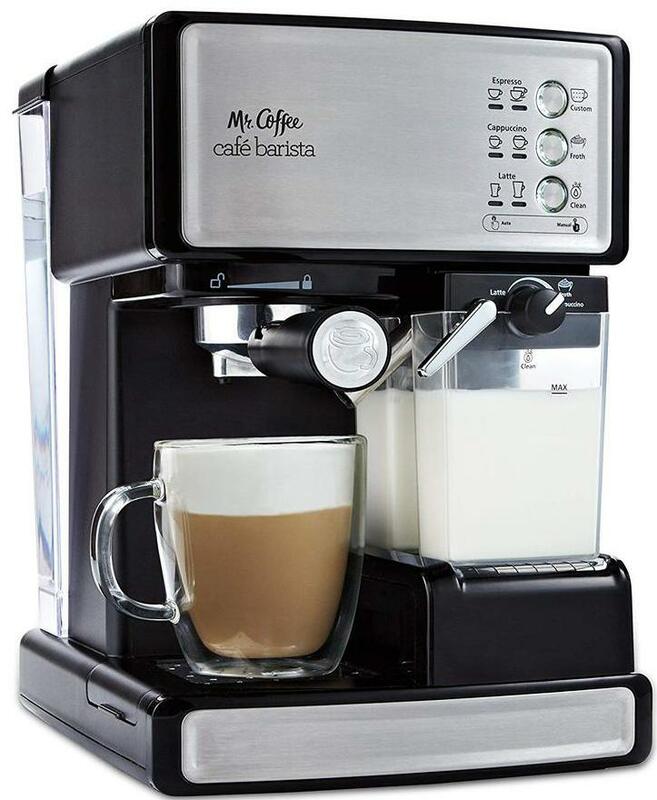 Unlike most espresso machines, the Mr. Coffee Café Barista actually comes with a removable milk jug. Once you’ve made your froth you can store it in the fridge. The machine also comes with a removable water tank, removable drip tray and measuring spoon. The Mr. Coffee Café Barista has a black plastic exterior with many added components such as a square milk jug, frothing tube lever, portafilter retention clip, and multiple control dials. A complete kit! This espresso machine allows you to make three different coffee types with its unique temperature control panel. There are no complications in understanding how to make the different coffee types as the control panel allows you to choose which coffee type to make. It also comes with a froth control knob to help you control the texture of froth your machine makes. What’s more amazing is that this machine comes with a cup height adjustment tray, allowing you to use any sized cup. Why we like it: The Nespresso Pixie Espresso machine is perfect for the bachelor or bachelorette. It’s a petite compact appliance perfect for small apartments. This nifty cheap machine is perfect for the college student needing a quick shot of caffeine before morning classes. Time is of the essence when you’re on the go. If making instant coffee has always been your thing, but you could never really get lovely flavors (or enough caffeine) this is your option. With the Nespresso Pixie espresso machine, you can get your shot of high caffeinated espresso with little to no time wasted. The 25 second warm-up function allows you to make espressos fast. With its grand automatic design, you can carry on with your morning routine while your espresso gets poured into your cup for you. And it’s an energy saver too. There will be no more worries whether you’ve switched it off or not because it automatically shuts down. The machine is easy to use and light in weight so there will be no trouble cleaning it or moving it around your kitchen to find the perfect spot. The Nespresso Pixie comes with all the parts you need to make the perfect cup of espresso. The machine has a removable water tank and drip tray. This product comes with a complimentary pack of 14 espresso capsules of different flavors so your coffee experience can start straight away. The Nespresso Pixie is a compact machine that comes in multiple colors that suit different kitchen interiors. There is a nonslip grip handle on the top to make it easy for you to move it around. The illuminated dials enable you to even use it in a low light environment. This design comes with a 19 bar pressure pump and a nine minute automatic shut off timer. You can make two different types of coffee with its one-touch programmable button so it’s a smart buy for families or office use. Why we like it: The Klarstein has a beautifully elegant design suitable for professional boardrooms and to give your kitchen that extra bit of sophistication. You would think that this machine is one of the expensive ones, but don’t let its look fool you. It’s excellent value for money and no one will think it’s a budget machine. 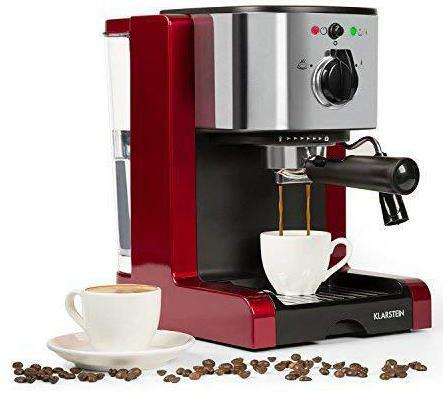 If you come home late at night from a function and you’re craving that rich taste of coffee but you don’t want to wake up the household, the Klarstein Passionata is very quiet for a semi-automatic espresso machine; Perfect for when you want to sneak in that quick cup of coffee. Although this design is a bit bigger than most coffee machines, the room it takes is worth the cups of coffee it makes. Although it’s part of the budget range in coffee machines, it definitely shares the quality of the finest and more expensive brands on the market. 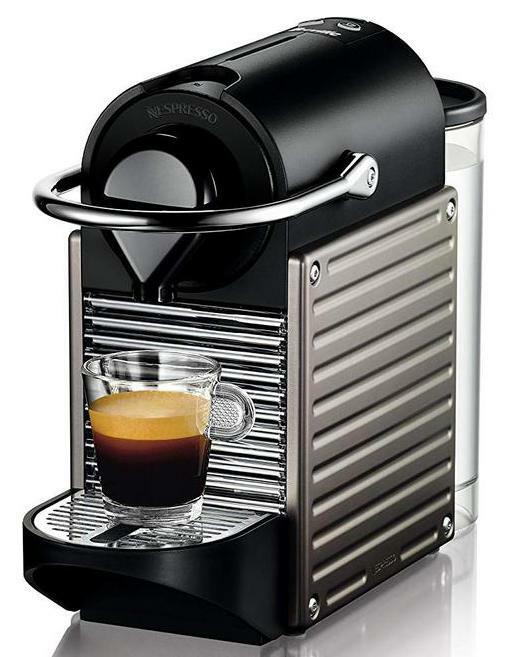 Besides its brilliant finish, this machine is versatile and ergonomical making it perfect for the home barista. Novice coffee connoisseurs will also appreciate its easy to use functionality. The Klarstein Passionata comes with a removable drip tray that has a stainless steel mesh top piece and a removable water tank. This machine comes with a measuring spoon to help you get the perfect coffee ratios. The machine has a complete stainless steel exterior which is silver in color. You can also get this design in a cherry red. It has a steam nozzle and slip resistant rubber pads. The Klarstein Passionata has a 20 bar pressure pump with a dual cup capacity which makes for many flavorful cups of coffee. You get two different measurement portafilters for the strength of coffee you prefer. It also has adjustable dials for simplicity and a heating tray means your coffee stays hot. Now that you have an extensive review on all the budget espresso machines under $200 and $500, let’s take a look at some extra features you should consider before you buy your new device. A semi-automatic machine is the larger more complex espresso machine type with multiple components and accessories. Depending on the brand you can produce a number of different types of coffee. Some of the machines are user-friendly and they can come in smaller sizes with less complex mechanisms. A drip brewer is very basic and doesn’t have any of the complexities of the semi-automatic. It’s more compact and light in weight & produces only one or two types of coffee depending on the brand. It doesn’t have a lot of functions and is more user-friendly. These machines are smaller and usually have grip handles so you can easily move the around. All that’s required is for you to place a pod inside the capsule holder and let the coffee drip into your cup. Some of these designs come in a number of colors for style. Different types of machines produce different tasting brews. Capsule machines make more watered down and strong based coffees. Semi-automatic and manual machines produce rich & creamy textures with more sweeter based brews. 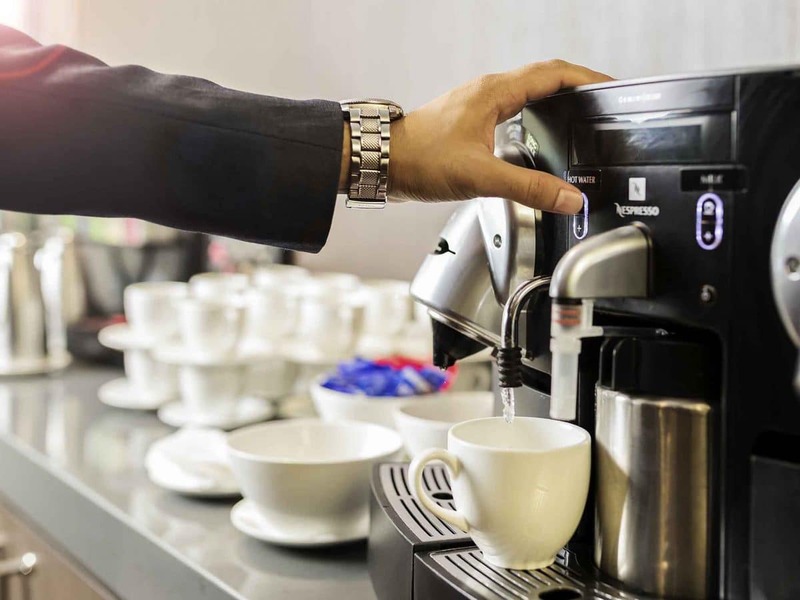 Automatic machines such as drip brewers tend to only accommodate multiple cups of coffee, whereas semi-automatic or pod machines only allow you to produce one or two cups at a time. Semi-automatic machines are extremely complex especially to a novice. It’s difficult to know where the components fit and how everything works without reading the manuals or doing some extensive research. A drip brewer only needs a push of a button to make an espresso, although the taste might not be as rich with a drip brewer. A drip brewer is extremely limited to the strength of brew you want or the taste of the coffee you prefer. A semi-automatic is more diverse in the controls allowing you to adjust the flavor and strength of your brew. It helps in knowing how to use a semi-automatic espresso machine if you want to produce café level coffees. A drip brewer is usually small and compact with a grip handle allowing you to move it around. It’s suitable for kitchens that have limited space. A semi-automatic is much bigger and has a lot of components that stick out. It’s a lot heavier and would probably be suitable for any size kitchen but preferable a large area. A drip brewer has fewer parts that need cleaning and maintenance so it’s easy to clean & put back together again. A semi-automatic machine has many removable components that need to be removed and cleaned regularly to maintain the machine AND coffee taste. Everyone enjoys a good cup of well-made coffee every now and then and life is too short to ever have a badly made cup-o-joe. You deserve only the finest your money can buy and with these amazing brands you can enjoy the art of coffee making without feeling bad about spending. Delectable coffee is yours for the taking.